Excellent start Goonfella! - that's exactly the use I had in mind. 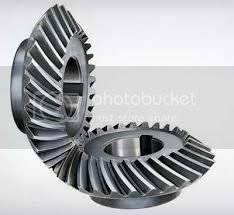 You should find the 'involute' tooth shape meshes with other gearwheels more easily than the other shapes. All shapes should be ok to line up together (if the tooth size is the same), but involute requires the least clearance gap. Good luck and thanks for posting the image. Well here is the finished image. Texturing has never been my strong point and I think it shows with the metal finish of the gears. I just could not get a satisfactory metallic finish. The rest of the clock I am quite happy with. Thanks Red for such a superb plugin. Well done Goonfella! - I can see how much work has gone into that - great result & thanks for posting it. Thanks Red/Skullbonz. I've just noticed something though. 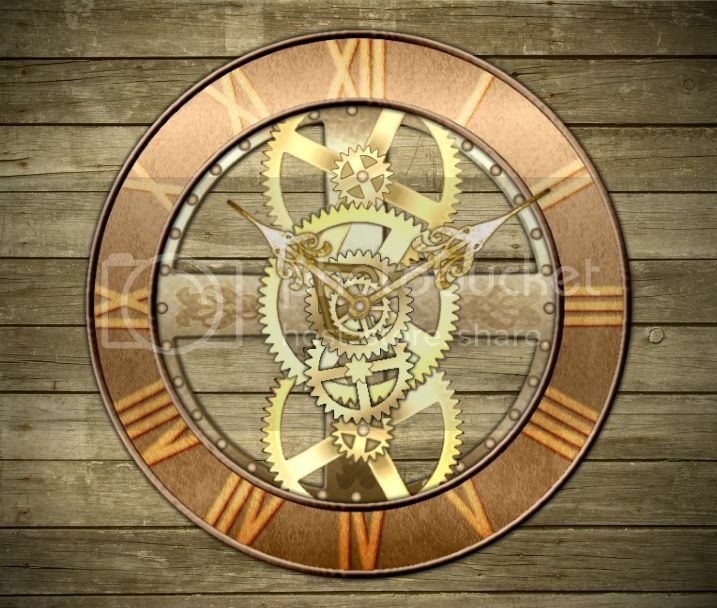 The large gears top and bottom should be behind the rim of the clock,not in front. I've still got the PDN file so I'll see about sorting this out. Details,details. On second thoughts , after trying that I have decided it looks better as at is. Here's my attempt and it worked out pretty well. Glad you are learning the 'tricks' to get a 3D look - thanks for posting the image. My apologies to the 67 people who have downloaded the first version. Please can you replace it with the updated version. I managed to crash the plugin with an out of memory exception and after investigating realised I had forgotton to 'Dispose' of a 'Brush'. New version disposes the brush correctly. ( Don't know why I overlooked the brush - I disposed the pen and the Path ok). No need to apologize Red. I would never have known about this problem if you had not mentioned it. Thanks for the heads up. Will go and upgrade right now. 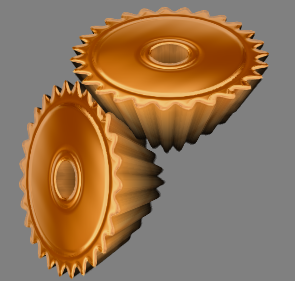 I was just wondering if it was possible to make bevelled gears ( like below) or would that need a whole new plugin? ... and those aren't straight forward bevel gears either - curved teeth to spread the load - clever engineers!. 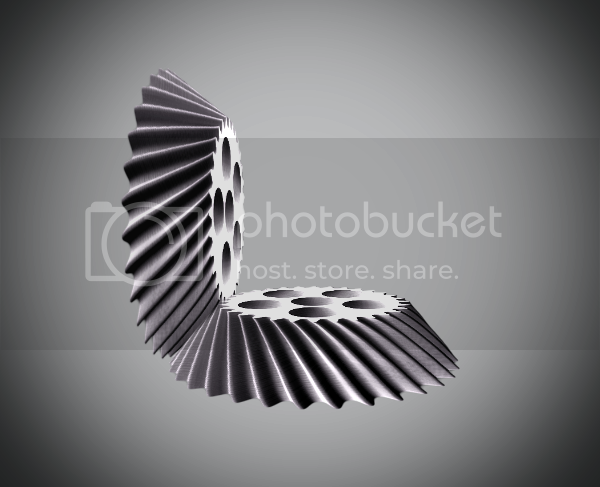 I thought about making a seperate plugin for a side view of simple bevel gears but to show bevel or crown and pinion gears like that would require including perspective. That would be really tricky on the maths side and mean loads more controls too. So probably beyond me. I tried making one with your Gears plugin but it really needs a 3D program like Blender. Thanks anyway. Best I could do - we really need a 'point/trail' plugin! - (I messed around with zoom Point blur). Very impressive Red. I'll have to go back and have another bash at it later. I had a quick go on your question, regarding the beveled Gears, and I think TR's Strobe Motion plugin works well, but I am having some difficulties controlling the location of the 4 points in the plugins to get a smoother render. After you got the twisted effect from the plugin, you can use this method to give it a conical shape. Ingenius! Top marks Yellowman and thanks for the video. In the end it was fairly straightforward. I'll have to have a go at this later. That is amazing, your skill in using Pdn and plugins is second to none. Glad you're finding 'Gears' useful. That's an excellent animation, the teeth mesh perfectly! Thanks for posting it racerx and welcome to the forum. Inspired by Goodfella's clock idea, I made a working model. That's amazing! - very skillful. It is very satisfying to see my plugin being used to such good effect. Thank you! @racerx! You are so welcomed. Thanks and respect for hard work.